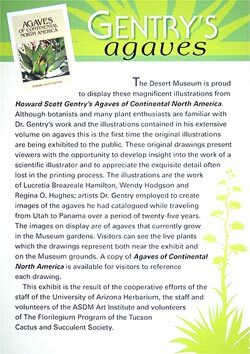 Illustrations from Howard Scott Gentry's Agaves of Continental North America is a the traveling exhibit, a joint effort between the University of Arizona Herbarium, the Sonoran Desert Florilegium Program, and the Art Institute of the Arizona-Sonora Desert Museum (ASDM) that brings to the public important historical works of art of plants indigenous to the Sonoran Desert Region. The thirty-one drawings in the exhibit are the work of three well-known botanical illustrators, Lucretia Breazeale Hamilton, Wendy Hodgson, and Regina O. Hughes. Viewers were given an opportunity to learn more about the work of scientific illustration and to become acquainted with one of the foremost botanists of the southwest, Howard Scott Gentry, whose work, Agaves of Continental North America, continues to be the definitive (taxonomic) authority on agaves. The exhibit also presented viewers with the opportunity to develop insight into the work of a scientific illustrator and to appreciate the exquisite detail often lost in the the printing process. These original drawings were first exhibited to the public at the ASDM in the spring of 2009 as a result of the cooperative efforts of the staff of the University of Arizona Herbarium, volunteers of the Sonoran Desert Florilegium Program of the Tucson Cactus and Succulent Society, and the staff and volunteers of the ASDM Art Institute. The Tucson Botanical Gardens then joined the effort to bring to the public these historical works of art. The following year, the exhibit went on the road to The Huntington Botanical Gardens in San Marino, California. Howard Scott Gentry contributed many agave specimens to the succulent garden at The Huntington, so it was an ideal venue for the exhibit. The exhibit was showcased at the reception for The Huntington's Annual Succulent Symposium. HOWARD SCOTT GENTRY. Read more about the life and work of Dr. Gentry whose contribution to the Huntington Botanical Gardens is described in this special commentary written by the staff of The Huntington for the exhibit. THE ILLUSTRATORS. Read more about three illustrators, Lucretia Hamilton, Wendy Hodgson, and Regina Hughes, represented in this exhibit. VIEW THE EXHIBIT. See the illustrations from the exhibit in this gallery. Photos of the exhibit from the three venues can be seen here.